I developed these muffins to use up some commercial "soynog" that I tried and didn't really like for drinking-- found it too spicy. I like my own homemade soy nog with just a little nutmeg grated on top for drinking. But any commercial vegan nog would work well in this muffin recipe. The muffins are not overly-sweet and make a nice snack or breakfast item. I tried to keep the fat reasonably low and the fiber over 5 g.
Preheat the oven to 400°F. Insert large paper cupcake liners in 12 muffin cups in a cupcake pan. Combine the Streusal ingredients in a medium bowl, mixing with your fingertips. Set aside. Mix the Dry Mix ingredients in a large bowl. Add the dried cranberries and pecans and stir briefly. Whisk or blend together the Wet Mix ingredients. Add the Wet Mix to the Dry Mix and mix briefly, only to moisten the Dry mix. Divide the batter evenly between the muffin cups. Top evenly with the Streusal mixture. Bake for 20-25 minutes or until they test done. Cool in the pan for a few minutes, then transfer carefully to a rack. Serve warm. They can be frozen. To reheat, slice in half and heat in a toaster oven at 400°F for a few minutes. Nutrition (per muffin): 385.7 calories; 20% calories from fat; 9.1g total fat; 0.0mg cholesterol; 119.3mg sodium; 321.1mg potassium; 74.8g carbohydrates; 5.5g fiber; 23.3g sugar; 69.3g net carbs; 4.7g protein; 7.7 points. Tina in her favorite new spot! We had a great time, ate too much (of course! ), talked alot, and the power stayed on despite some high winds! Today (a beautiful, sunny, windy day) we're having miso soup for lunch, and something very light for dinner-- maybe another soup, like mushroom and barley! that I WAS planning on squirting decoratively with Soyatoo soy whipped topping , but it would not come out of the can! It worked that last time I bought it-- anyone else had this problem? (They also have a "Rice Whip" )I'm going to take it back. I wish we could get the "Topping Cream ", which evidently you can whip yourself. I'm going to suggest it to my HFS. Anyway, I made my tofu crepes , but I used commercial soy eggnog instead of the regular soymilk. I had bought two kinds of storebought soynog for the first time-- Vitasoy and So Nice-- and didn't like either of them! I prefer my own version from my soy cookbook. So, I'm using up the rest of the commercial stuff in cooking. 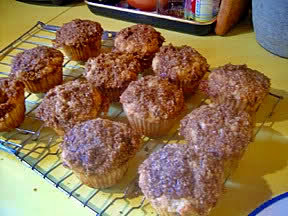 It worked well for the crepes, and I also made some eggnog-streusal muffins. I'll post the muffin recipe in a day or two. We had dinner at my son's house-- not vegetarian, but I brought a Fieldroast "Celebration Roast" for us, which was very tasty! Boxing day (December 26th) is traditionally our family day (makes it more flexible with all the respective inlaws! ), so my two oldest daughters and their families, my mother, 3 vegan friends, my son and his wife (minus kids, as they were at their other parents'), and my stepson Laurie came to our house (my youngest daughter and her family and DH's son Sean were missing this year). I served my seitan "turkey" and "pork roast" (rolled with fresh herbs and garlic), brown gravy, mashed potatoes, baked traditional bread stuffing, 5-spice cranberry sauce with almonds, spinach salad with roasted beets and oranges, pot pie with Soy Curls , vegetables and creme gravy, Brussel ssprouts stir-fried with red pepper and green onions, and my friend Fireweed's roasted root vegetable combo. I'd love to hear about your vegan feast! Just a note to say that we have no phone (and, thus, Internet) access (I'm writing from work again, but I won't be back for a week), and they're not giving us much hope for a speedy recovery. Apparently it's a two-man job, but they won't send another guy out. The local (very kind) technician said he might be able to do a temporary patch job if my DH helped, so we'll see. UPDATE 5PM: We have phone and internet access again! The technician came late in the day and my husband just phoned and said it was patched up, so, barring any big windstorms, it should hold until he comes back. Sunday there is a forecast of winds up to 90k an hour, but that's less than the last big storm that hit. The recipe was in an article that I wrote for Vegetarian Times magazine in 1995-- but now I use a package of Yves "Ground Round" (vegan "hamburger" crumbles) instead of the ground seitan. The recipe, unfortunately is not available online, though you can access it through your local libary electronic magazine archives. (NOTE: In the recipe on that site, the baking time inexplicably reads "SO"-- it should read "50-60 minutes, or until the pastry is done to your liking".) You'll find other French-Canadian recipes there, and some background on the Réveillon (REV-e-yawn), or Christmas Eve, feasting and traditions. UPDATE: DEC. 2014: See my new vegan Tourtière recipe here! HAPPY HOLIDAYS TO YOU ALL (and I'd love to hear about your vegan holiday feasting)! THE SAGA CONTINUES, WITH PICTURES AND A COOKIE RECIPE (GLUTEN-FREE, IF YOU LIKE)! A new version of my old Christmas cookie recipe "Chinese Chewies", which I'm calling "Pecan-Cranberry Chewies"-- these were gluten-free, but you can also make them with wholewheat pastry flour. I made these just before the power went out! 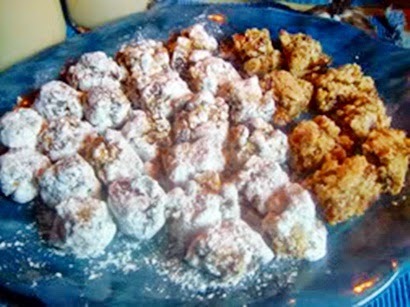 This photo shows the cookies cut and un-sugared, cut and sugared, and cut, rolled, and sugared. UPDATE, Dec. 2011: here is a page about the origin of "Chinese Chews" and the original recipe from 1917. "The origin of the name “Chinese Chews” for a snack with dates and English walnuts is a mystery that has not been explained." This was the heavy, slushy snow coming down last Thursday-- picturesque, but mucky! Well, the good news is, after 8 days, we finally have power again! The bad news is, now we have no phone access, until about Thursday! I was so depressed about that I could hardly enjoy the good news! I regret to say that I was in a really foul mood about the phone and DH had to put up with alot of whining and whingeing (as they say in the UK!). But, we attended our first Christmas party last night (very reluctantly on my part), and had a lot of fun and good food, and good laughs, so I feel better now. What can you do about it anyway? Saturday, our close neighbors got their power back, but we had to wait because we were not a "multiple outage". Our neighbors just below us lent us their 1000 watt generator for the last 2 days or so, so at least we could have a lamp or two on, watch TV now and then, or even use the computer or a kitchen appliance. But, to use the computer, I had to bring the whole set-up down to a different spot and it was a bit of a nuisance, so I only did it once for 1/2 an hour. Now, I can use the computer, but of course, this means we have no internet access because we have no phone line! I was able to download the photos off of my camera to my computer, resize them and put them on a disc, though. So I could put them on Photobucket from the disc here at work and use them on the blog. Anyway, you're probably getting tired of hearing about it! I'm getting tired of writing about it! I hope that by Thursday, things will be normal, and I can write about Christmasey things! Thank you all for your comments and good wishes! Here is a not very good photo of the debris on our deck after the windstorm. It really doesn't do the whole thing justice, but it's all I have. Here's the recipe for the "chewies". They are fat-free except for the nuts-- very sweet, but pretty good for you, and really delicious. Ps: i will add the nutritional info later. The original version these bars (called "Chinese Chewies", and I have no idea where they got the name!) have been a favorite Christmas cookie for years. The original recipe contained eggs. I veganized it, and now discovered that a gluten-free version works just fine! The first time I tasted these was at a Hanukkah party at my cousins' Baba's (grandmother's) house many years ago. Had to try to make them myself! They were originally made with just dates and walnuts. Beat in the sugar and vanilla briefly. Scoop this into the bowl with the flour mixture, along with the dates, cranberries, and pecans. Mix gently but well. Scoop the mixture into a nonstick or lightly-oiled or sprayed 8" square cake pan (you can line the bottom with cooking parchment , if you like). Bake for 25 minutes, or until it begins to turn golden (it will be soft). Cool slightly on a rack, then cut into small pieces (32-36) and roll in powdered sugar, if you like. You can also take the squares while they are pretty hot and roll them and squeeze them into little balls, and roll in powdered sugar, if you prefer. Cool thoroughly and store airtight. Nutrition (per 1 square or bar, recipe cut into 36): 80.1 calories; 24% calories from fat; 2.3g total fat; 0.0mg cholesterol; 15.9mg sodium; 84.2mg potassium; 15.1g carbohydrates; 1.2g fiber; 8.4g sugar; 13.9g net carbs; 0.7g protein; 1.6 points. Mix well and store in a moisture-proof container in in the freezer. Use cup-for-cup instead of regular flour. NOTE: Because non-gluten flours lack the structure that gluten provides, xanthan gum or guar gum (available in health food stores) is often added to gluten-free baked goods. This mixture contains enough xanthan or guar gum for cakes, cookies, pancakes, and quick breads. For yeast breads, you may have to add up to 1 tsp. more gum per cup of gluten-free flour. Nutrition (per cup): 607.8 calories; 9% calories from fat; 6.8g total fat; 0.0mg cholesterol; 19.0mg sodium; 399.0mg potassium; 126.2g carbohydrates; 10.4g fiber; 0.9g sugar; 115.8g net carbs; 10.3g protein; 11.9 points. Hi, again! I am at work writing this again, because we still don't have power (5 days, now!) Parts of the island have power now--- the downtown, and nearby. My mother (thank goodness, because she's 89 and pretty game, but she was getting fed-up) and my son, who live near the downtown, got power last night, so we went to my mom's and had showers! But, on the next island over, Hornby, where my oldest daughter and her family live, NOBODY has power yet! Thanks for all your good wishes and prayers! The last two storms did not turn out to be as bad as the first one, thank goodness, but there has been lots of rain, and yesterday it snowed 4 slushy, heavy inches and then rained again (now it's sunny!). We did not get the bad winds, thank heavens (we need a break!). But Vancouver and the Lower Mainland, Victoria and the Washington/Oregon coast got it really badly, as Debbie mentioned, and I really feel for them. We just might get power tomorrow, but I think that is overly-optimistic. I think maybe Weds. They JUST got the power to the ferry terminal on Denman Is. this morning. There are contracted tree-cutters all over the island and they did cut the trees off our power line this morning, but the Hydro crew has to reconnect everything, and there are still big lines down on many of the major roads. So, I don't think they'll get to us for a long time. I was getting a bit depressed, because it's hard to feel Christmasy, and everything takes so long, it's so dark (unless we get sun, like today), etc., etc. I should be working on the newsletter and the e-book! But, I decided to be positive and regard it as a holiday from work. I'm getting lots of reading done and catching up on sleep, since we get to bed really early! And, after all, how can we feel sorry for ourselves when we think of all we have compared to so many? We got head-lamps (like cavers use) and that has been great--free hands! We're warm and dry; we're collecting lots of rain-water, so water's not a problem; we have lots of food and are eating really well. We still have our phone, and now we can even have showers and wash clothes nearby! Fortunately, as you know, we have no meat in our freezer, so there's nothing we can really lose. The freezer is old and heavily-insulated and I hadn't defrosted it recently, so it's actually still got ice in it! We are eating the things as they thaw (reconstituted Soy Curls, veggies, etc.) and have not even had to resort to canned and dried foods yet! We use our deck as an outdoor fridge. It reminds me of when I was young and was "homesteading" with my late husband Wayne and my kids in the 70's. We lived voluntarily without power or running water for 3 years, and without running water for several more! As I washed my hair in the sink yesterday after heating up the water on the woodstove and using a pitcher to wet my hair, I was reminded of the school mornings when my 3 teenage girls would all be doing this every day! We didn't even have a TV in those days either, but we had lots of fun. It also has made me very aware of the over-consumption at Christmas time, for some reason. I'm not THAT old, but I can remember feeling so thrilled to get a special doll and a few other things. Parents might get eachother a nice article of clothing, or something like that. But ordinary middle class people didn't buy what would have been the equivilant of these games and other pieces of technology that cost hundreds of dollars that people spend,spend, spend (and feel somehow obliged to spend!) now. Most of us think nothing of buying these things for ourselves, anyway, so why do we need other people to get into debt to buy us something more? We're keeping it really simple this year. Getting together is the main thing. And our extended family is helping out a family member who really needs it right now instead of getting gifts for all the nieces and nephews, etc..
My daughter-in-law Amber did a really nice thing (now that I'm on the subject). We have homeless on Denman Island, believe it or not. A couple of individuals who have been dealt some hard knocks in life and, though very smart and hard-working, have a problem with alcohol. They live in donated vans. Amber pre-paid for some gas for their vans at the local store. A very kind gesture. To digress, I've been taking photos, but I can't upload them and resize them, so blogging with photos will have to wait. I got out my Chinese stacking bamboo steamers and they have come in handy for reheating leftovers. What did we have for dinner last night? Frozen potato-and-onion pyrogies (well-- half-frozen! ), boiiled and then sauteed in a little Earth Balance with mushrooms and oniosn and a few Soycurls, topped with leftover brown gravy. Spinach salad on the side. No too shabby! Oh, and by candlelight, of course! Been a long time between blogs! My cousin Chris from Vancouver came for a visit last weekend with my youngest daughter Justine, and my youngest grandchild (and grandson). Despite having to trudge up and down the 1/2-mile long, quite steep driveway covered with snow, we had a great time! LGS (Littlest Grandson) is talking up a storm and is such a doll! At my son's house we had a family party with their 3 girls and my daughter Sarah's family with her 3 girls. Littlest Grandson had all the girls under control, I can tell you! Saturday and Sunday were the days for the annual Denman Is. Christmas Craft Faire. On Sunday my son Tim's daughters, all budding cooks, had a half-day booth. The oldest, made snowflake shortbread cutout cookies and caramel corn to sell, and the two younger girls made homemade lollipops, mounted on a "lolllipop tree" that my son made. Everything was delicious, and the lollipops, though "freeform", looked beautiful and were very long-lasting. They liked making them so much that next year they plan to make a totally organic version with all kinds of different natural flavorings and colors! Tim already has an idea for a rainbow display, too. They sold lots and made their own Christmas money! I brought Tim back home to visit more family, especially our 89-year-old mom. Now we can drive up our driveway-- yay! 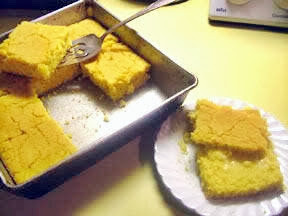 Before I left I made this yummy cornbread-- with no wheat flour, so celiacs can eat it! It's nice and corny! I adapted this from a recipe in "The Best Light Recipe " by Editors of Cook's Illustrated magazine. Mix together the first cornmeal, sugar, salt, baking powder, and soda in a medium bowl. In another bowl mix together the 2/3 cup cornmeal and the boiling water and stir well. Stir in the lemon juice/soymilk mixture, flaxseed and melted vegan butter. Pour this into the dry mixture and mix briefly. Pour into a well-greased 9" square baking pan . Bake for 25 minutes or until it tests done and is crusty on top. Nutrition (per square [cut into 9 pieces]): 157.5 calories; 24% calories from fat; 4.3g total fat; 0.0mg cholesterol; 341.8mg sodium; 264.0mg potassium; 27.4g carbohydrates; 2.6g fiber; 5.2g sugar; 24.8g net carbs; 3.7g protein; 3.0 points.